NBC 4 New York / WNBC and Telemundo 47 New York / WNJU are teaming up with the four-time Super Bowl champion New York Giants for the sixth annual free family-friendly Health & Fitness Expo, presented by Quest Diagnostics. 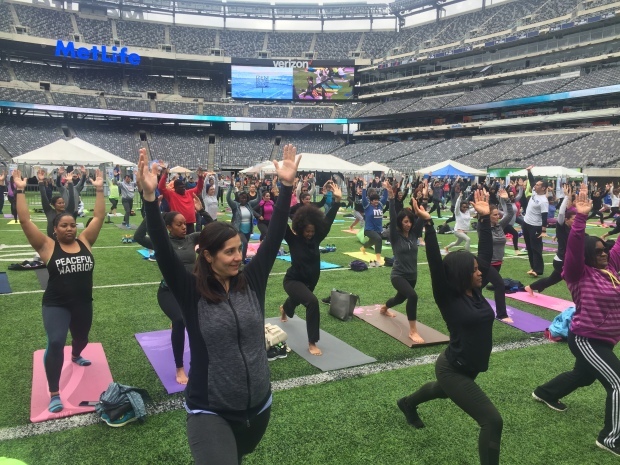 One of the tri-state’s largest open-to-the-public health events, the Health & Fitness Expo will be held at MetLife Stadium on Saturday, June 23, and Sunday, June 24, from 10 a.m. to 4 p.m. each day. To access a calendar invite, click here. Complete your waiver now for faster access. COACH USA - 351 - The Port Authority bus service will provide transportation to and from the event. The 351 Bus Service will run hourly on Saturday, June 23, and Sunday, June 24, from 9 a.m. to 4:30 p.m. The buses will leave from New York’s Port Authority Bus terminal (Gates 410, 411 and 413) to MetLife Stadium Lot K.
Join NBC 4 New York's sports anchor Bruce Beck for this family friendly event! Walk the 50 yard line, tour the locker rooms, ride a zip line and meet a New York Giant! Plus, get free health screenings courtesy of Quest Diagnostics. June 23 and 24 at MetLife Stadium. Admission and parking are FREE. NJ TRANSIT – 353 – NJ Transit will provide transportation to and from the event. The 353 will run hourly to and from Secaucus Junction station and Lot G at MetLife Stadium on Saturday, June 23, and Sunday, June 24, from 9 a.m. to 4:30 p.m.
NBC 4 New York’s lead sportscaster Bruce Beck and Telemundo 47’s lead sportscaster Veronica Contreras will join New York Giants’ All-Pro safety Landon Collins as co-hosts of the health and fitness-focused event, which averages 50,000 visitors over the two-day span. Beck, Contreras, Collins, NBC 4 New York and Telemundo 47 anchors and reporters, as well as active and retired Giants players, will all be on hand throughout the weekend to meet attendees and sign autographs. “The Health & Fitness Expo is free and filled with a number of family-friendly activities designed to promote a healthier lifestyle. Working with our partners at the New York Giants, it is also the only place where viewers can tour the Giants locker room, meet our WNBC anchors and reporters, and ride two zip lines from one end zone to the other,” said Eric Lerner, President and General Manager of NBC 4 New York. Visitors will have the opportunity to walk on the actual field where their favorite athletes play, and will even have access to exclusive locker room tours. While on the field, visitors can access two zip line towers and participate in a number of activities designed with their health in mind, including scaling a rock wall, running the 40-yard dash and joining the “Giants Experience” presented by Verizon where fans can participate in football-themed activities on the MetLife Stadium field. New for 2018 and in conjunction with FIFA World Cup Russia, the Expo will feature the Telemundo 47 World Cup Tailgate highlighted by live viewing parties for the weekend contests. Through Telemundo Network’s El Campeon En Ti,visitors can also practice their soccer skills and take their best shot on a special soccer goal. A special instructional clinic will also be available to attendees, featuring soccer professionals from across the tri-state area. “As the Spanish-language home of the 2018 FIFA World Cup Russia, health and fitness are very important to our viewers and the Spanish-speaking communities we serve across the tri-state area. This is why we have built a new soccer activation where all visitors can practice their skills and ‘take their shot’ on goal. We look forward to delivering an action-packed weekend of fun activities to our Telemundo 47 viewers – all designed with their health in mind,” said Cristina Schwarz, president and general manager of Telemundo 47. Additionally, all visitors will be able to obtain their “Passport to Health presented by Quest Diagnostics” by completing a series of health-themed activities, such as fitness tests and health screenings across MetLife Stadium. Visitors completing all passport-related activities will be eligible for giveaways and special prizes awarded throughout the weekend. For the sixth straight year, Quest Diagnostics is the presenting partner of the NBC 4 New York & Telemundo 47 Health & Fitness Expo at MetLife Stadium. Quest will again be on-site offering attendees 18 years and older complimentary health screenings at the Quest Diagnostics Health Center, located inside the MetLife 50 Club within the Stadium’s main Great Hall. Quest will be offering testing for cholesterol, vitamin D, kidney function and blood sugar level. Each attendee who participates in the free testing will receive their test results directly through the MyQuest mobile health app and online health management system. Visitors can meet their favorite anchors and reporters at a special, redesigned NBC Village. The Village will also include a new, interactive weather center where visitors can try out their forecasting skills and meet weather experts from both stations. Visitors will also be able to tour NBC 4 New York/Telemundo 47 weather vehicles including StormRanger 4/CazaTormentas 47, a first-of-its-kind mobile Doppler weather radar truck; and StormChaser 4/BuscaTormentas 47, a military-spec sport utility vehicle which can travel directly into storms. Further, visitors to the NBC Village can take a photo at the Today Show desk and in the famous contestant chair from “The Voice." A new “Inspire Wellness Stage” will feature motivational speakers and informational presentations throughout the weekend, located in the Commissioners Club with available seating for 100 visitors. Confirmed speakers include actress Fran Drescher, star of the “The Nanny” airing on COZI TV. Drescher is also a cancer survivor and the president of “Cancer Schmancer,” a non-profit promoting prevention and early detection of cancer. Separate stages will include the FitnessAge Challenge, a program that reveals your “fitness age” and the UniversalKids Family Fun Zone, featuring healthy activities designed for kids and their families. The “NFL Play Football Summer Season” will demonstrate their Heads Up Football program, teaching safe tackling techniques and proper equipment fitting on the field. Once again, Expo visitors will be able to enjoy healthy cooking demonstrations throughout the weekend and meet with on-site experts to discuss integrative approaches to disease prevention, healthy dieting and nutritional information. 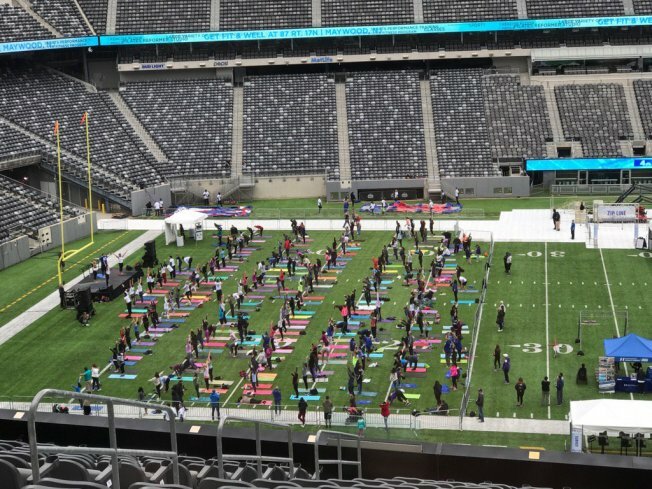 The mega-yoga activity, “Zen in the Zone,” presented by Hackensack Meridian Health, will also invite a crowd of 1,000 yogis to practice yoga on the MetLife Stadium field for the fifth consecutive year. In conjunction with Telemundo 47’s community initiative "El Poder en Ti", the Hispanic Federation will be on site to offer families resources on citizenship, immigration, and voter registration. This includes referrals to reliable and low-cost community resources available for Tri-State families. In conjunction with Clear the Shelters, NBC 4 New York and Telemundo 47’s tri-state pet adoption initiative, St. Hubert’s Animal Welfare Center will appear at MetLife Stadium for both days of the Expo. Through their mobile adoption unit, St. Hubert’s will offer Expo visitors a unique opportunity to meet a homeless pet in need of a forever home. Free parking will be available for the two-day event. The Port Authority bus service will also provide transportation to and from the event. The 351 Bus Service will run hourly on Saturday, June 23, and Sunday, June 24, from 9 a.m. to 4 p.m. The buses will leave from New York’s Port Authority Bus terminal (Gates 410, 411 and 413) to MetLife Stadium Lot K.